Well, it’s been a busy day here at KOSS towers and we love to talk! We’ve created a brand new community – our very own Bloggers Network site to bring together bloggers from all over the UK and we’ve been emailing you lovely lot asking if you’d like to come aboard and join the blogging community! We’re looking for bloggers to review our brilliant new brands and lovely products on our Kids One Stop Shop website too… (email becky@kidsonestopshop.co.uk if you would like more information) If reviewing isn’t your thing but you’ve plenty to share we’d love you to get involved with our new interactive Parent and Kids Zone pages! Our Parent Zone will be packed full with practical parenting advice, information and features. The Kids Zone has been design to bring everyone together – it has a great framework so please do help us create and build a cool directory of interesting and interactive fun ideas! Share the love by sharing your arts and crafts and rainy day activities… we’d love to feature any of your family friendly recipes too – let’s all work together to create a Kids One Stop Shop Community Cookbook! If you have any questions or would like to add any comments/feedback to any of the features/articles on our Parent and Kids Zone pages please feel free to post away – we’d love to hear from you! Spend £50 you will receive £5 off – spend £100 we will give you £10 off! Valid until the 1st of May. To receive these offers please quote KOSS5 for £5 off and KOSS10 for £10 off at checkout. Take advantage of our great shopping features, wishlist, save for later & social media sharing – happy shopping! Our hot picks – from your fabulous feedback! We asked you lovely lot what brands you would like to see on our site – and hey presto! Here are a few of your suggestions – do take a look at our hot picks! We’re delighted to announce that Gummee Glove are now on board with us… a number of you told us how great Gummee Gloves are – check out these super little teething aids! Summer is nearly here… Check out the beautiful summer party dresses from Toby Tiger Lots of spotty cottons and wonderful prints for your little VIPs! Brilliantly bright designs for boys and girls – everyone loves colour! If you have any brands you would like to share – please get in touch below or email us – we’d love to hear from you! Fantastic feedback on the new site – a few little bug fixes for you! We’ve had some great feedback on our new site – however, a small number of our users have difficulty viewing our new site and that will not do! - done! Your Window DNS cache has just been flushed. You should now be ready to browse – happy shopping! Who are the faces behind Colourful Dove? We’re a husband and wife team, Mark Baldwin and Helen Molyneux. We’re parents to two lovely girls and a dog called Macy. Our backgrounds are in design, marketing and branding and we’ve been lucky enough to work with some fabulous brands over the years to hone our skills so we could launch our own product! We’re passionate about great design and especially when it’s bright and colourful and can brighten up your day and make you smile. That’s what it’s got to be about: making every day colourful to make you smile. Why and when did you create Colourful Dove? We launched colourful dove in January 2013 after a long period of thinking, planning and researching all driven by a love of design and inspired by our girls. We love contemporary design and especially anything a bit quirky and different that looks good but is practical too. Our girls love bright bold colours and when they came to the stage of eating solids we searched for tableware that we’d love to have on our table and that would inspire and engage our children to enjoy mealtimes. We couldn’t find what we were looking for so we naively thought let’s make some! And so colourful dove was born! What’s your mission? Our mission is simply to make every day colourful. We want to use colour to engage and inspire children to live, learn and love being children. We also want to offer parents a tool that can help them educate and engage with their children by talking about the colours, the words and the animals to help their children enjoy learning. What do you wish people knew about Colourful Dove? 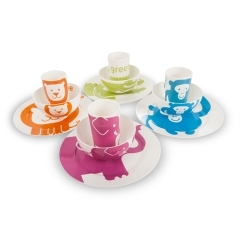 How the tableware really does help parents teach their children to learn their colours and animals. Our girls have now started to read and write the words so it keeps on teaching even when they’ve learned their colours. Not only does the tableware look great it’s a valuable educational tool too! What’s Colourful Dove’s secret to success? Keep going; keep smiling! We’ll get back to you on whether it works when we have a bit of success to shout about! Thank you Colourful Dove - visit their store-front now! Visit our brand new on-line ‘one stop shop’ for a great range of children’s products; toys, gifts, living & fashion for all the family! Check out our interactive parent & kids zones, join our blogging community! We’re super excited to announce that our 100th customer today will receive a £25 voucher! Kids One Stop Shop Relaunches Friday 19th April! Exciting news about our new Parent Zone and interactive Kids Zone pages to be released soon – watch this space! Happy Easter! Our new site is hatching as we speak! Not long until the launch of our brand new and improved website – we’ve lots of brilliant new brands on board – and we’re sharing the love by offering you an exclusive discount code – simply go to our old site http://kidsonestopshop.co.uk/ and sign up!